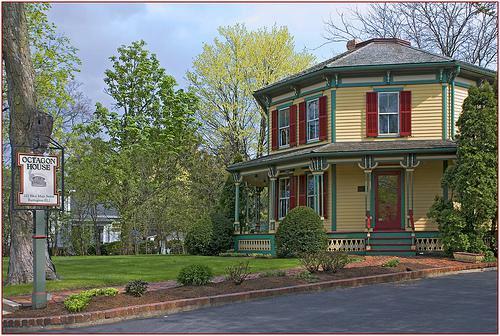 Dating from 1861, this eight-sided house with its cupola top, dormer windows, and roof lanterns was built in the belief that such octagonally shaped houses promote healthier living. Dating from 1861, this eight-sided house with its cupola top, dormer windows, and roof lanterns was built in the belief that such octagonally shaped houses promote healthier living. Today, the building is an American Colonial museum. It has many artifacts on display including antique furniture and historical documents. It is run by the National Society of the Colonial Dames.